Edited by: Roger M. Blench. 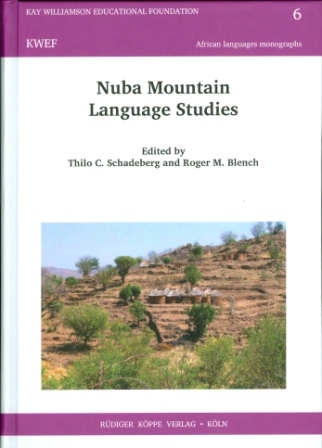 The volumes of this publication series have been produced either in Germany or in West Africa and are distributed worldwide by our publishing house. Compiled by: Erik John Anonby, Kada Bouba Oussoumanou. Compiled by: Karl Grebe, Patrick Siiyatan. Compiled by: Etienne Lonfo, Stephen C. Anderson. Edited by: Thilo C. Schadeberg, Roger M. Blench. With an introduction by: Thilo C. Schadeberg, Roger M. Blench. With contributions by: Ashraf Kamal Abdelhay, Farrell Ackerman, Thomas Kuku Alaki, Suzan Alamin, Abeer Bashir [show more…], Roger M. Blench, Jade Comfort, Ines Fiedler, Leoma Gilley, Gumma Ibrahim Gulfan, Harald Hammarström, Birgit Hellwig, Ali Ibrahim, Enrico Ille, Khaleel Ismail, Angelika Jakobi, Peter Jenks, Khalifa Jabreldar Khalifa, Stefano Manfredi, Leif O. Manger, John Moore, Abdel Rahim Hamid Mugaddam, Angelo Ngaloka Naser, Russell Norton, Nicolas Quint, Sharon Rose, Thilo C. Schadeberg, Gertrud Schneider-Blum, Mariam Sharif, Heleen Smits, John Vanderelst. Edited by: Roger M. Blench, Stuart McGill. With a preface by: Roger M. Blench, Stuart McGill. With contributions by: Roger M. Blench, David Crozier, Stephen Dettweiler, Daniel Gya, Matthew Harley [show more…], Selbut Longtau, Stuart McGill, Sophie Salffner, Rebecca Smith Paterson, Anne Storch, Andy Warren-Rothlin. Edited by: Anne Storch, Gratien G. Atindogbé, Roger M. Blench. With contributions by: Gratien G. Atindogbé, Roger M. Blench, Evelyn Fogwe Chibaka, Zygmunt Frajzyngier, Daniel Gya [show more…], Birgit Hellwig, Robert Koops, Rudolf Leger, Selbut Longtau, Helma Pasch, Anne Storch, Ulrike Zoch. Edited by: Judith H. Hollingsworth, Kenneth R. Hollingsworth.